Most of you know that I have a thing for stripes, especially black and white stripes. So with the power of Pinterest, I created a board where I can collect any stripey inspiration that comes my way! Have any of you succumbed to the power of Pinterest? It is so amazing. For someone who is visual like me, it is a fabulous resource to catalogue any pretty or idea that comes my way. Here are a few beauties that have caught my eye! Hello? Where have you been all my life? Gorgeous entry that was featured on Apartment Therapy. 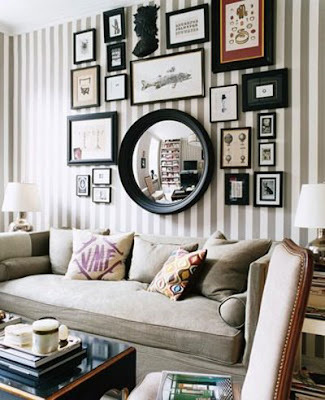 What could be more perfect, a striped wall and gallery wall together? Stripes just make these muffins look so much better. 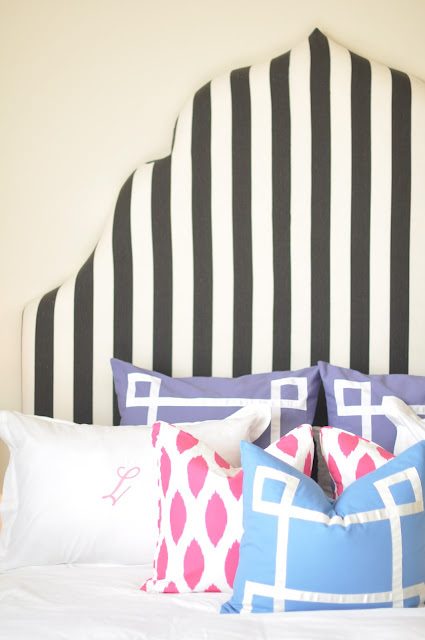 Nothing better than a striped headboard. And fabulous chevron drapes in a house designed by my favourite designer, Tommy Smythe! Are you on Pinterest? You can follow me here. What have your been pinning lately? I'm loving the chevron wallpaper in that first picture. It's a bold look with that gold mirror. Perfect for making a statement in the entry way of a house! Thank you for sharing these! I love stripes too! I really want to do a painted stripe set on my wall, thanks for some inspiration. i haven't become addicted to pinterest...yet. i'm afraid i would get nothing done. :) i have an account and it is calling me...don't know how much longer i can resist. Oh I missed those cupcake holders on pinterest. I am going to see if I can find them and order them. You know you are I are together with the stripes. Whenever I see b&w stripes i immediately think of you:) What are your thoughts on the new trend toward painting crooked or uneven stripes? Love a good black and white stripe...that foyer with the dark stairs is amazing...also adore the wing chairs and settee!!! wonderful examples...I cannot see a stripe now and not think of you! I truly can see why you are smitten with them! Thanks for sharing! Love that entryway and those drapes! I love stripes too! So stylish and works so well for both boys and girls! Totally crazy about that gilded mirror on that chevron wall, that pair of wing back chairs in mod black and white chevron, and how could we not love that room designed by the talented Tommy Smythe? Can't wait to see how you use stripes and chevrons in your new project! Those stripes DO make the muffins look so much better! love the navy and white - such a classic combo. I have an insane obsession with stripes. Painted thick graphic black and white striped in my sons nursery! Anything I do lately I want to do with stripes involved. so much goodness!! We are doing a great GIVEAWAY!! Please visit us to learn how to enter and have a chance to win this truly awesome product!! Lovely finds for your Pinterest boards!! I want to redo my wing backs in black and white chevron! I love it! It's funny ....... you're all about the stripes and I love the contrast of the black & white. Although I think I O.D'd on stripes in my wardrobe. You know that show "What not to wear"? Well, I'm the girl that migrates to the same thing in the store all the time ....... STRIPES!!!! me too...love all these images. I have always been a fan of Tommy. I think he has always had the ability to give that little eclectic vibe to Sarah Richardson that makes her spaces more interesting to me. Right now I seem to pinning a lot of symmetrical rooms and I am on a bookshelf bend as well. I hope SOPA does not cause problems for Pinterest!